One Minute! One Idea! Ep. 16 "Step Inside and Pass It On"
It’s that time again…the season ending episode 8, and if you’re a fan, you know that this is when we go behind the scenes for an extended play episode. This entire season has been about our cabin restoration as an allegory for leadership and culture, so now is the time for us to cut to the chase and yes, go tour the cabin and see all of the things we’ve talked about in the first seven episodes. Logs, floors and tables…we will see it all. No shiplap – that’s been done – am I right? So, put in the terms of a famous warrior and philosopher, (Yoda) – "Tour the cabin, we will." Just a quick recap...our process began when we embraced the inevitable, and for our cabin, this historic home, it meant accepting the fact that the years- three centuries really were catching up with it. When we bought our farm, we knew that the cabin came along with it. It was the thing that hooked us...that grabbed us by the heart but it took us a while to realize that we had also inherited an historical legacy. When we enter the cabin, we experience a sort of "Cathedral Effect" a term coined by my wife Rebecca - a feeling of calm and connection that we believe is related to the generations of families that have lived here before us. Others feel it too a sense of belonging that transcends wood and stone and steel. That feeling helped us to realize that as certainly as we owned the cabin, it owned a piece of us. It became clear that it was our inevitable responsibility a new part of our purpose here - to leave a legacy behind by paying it forward by putting this remarkable little home in shape to last at least another century, and that became our shared vision for the project. You may recall that in episode 4, we faced our next challenge where to start? We eventually realized that many of the cabin's problems began in its ancient, dirt-floored cellar. None of the work we would eventually do would mean anything unless we literally repaired the foundation, the rocks and stones upon which everything else stood. The logs overhead are solid, but most of the mortar had fallen out of the stone walls in the cellar and the floor was literally dirt, with no drainage or airflow of any kind. Workers literally dug down to the base of the stone walls, and poured new buttress walls to brace and strengthen the foundation itself. We installed drainage, a vapor barrier, a new concrete floor and carefully repaired the stone walls. Now it's as good as new -actually better– and a suitable foundation for everything to come. That brought us to our next big dilemma. In episode 5, we talked about the fact that we had design and construction choices to make while staying true to the authentic nature of the cabin. We realized that what we needed were guiding principles –values– that would guide us in the restoration, and we came up with two. "The new must honor the old, and the old must be present in every room of the new". Now to apply those lofty principles. We tore down the addition and replaced it with new construction carefully designed to complement the original structure. We had recommendations to drywall or paint over the logs, but our guiding principals steered us a different direction – We exposed them and sandblasted everything with crushed walnut shells – a firm but gentle technique used in classic car restoration –just enough to clean them up while preserving their character. In the kitchen the floors are reclaimed oak fence boards from the area. Kitchen cabinets built from reclaimed Pennsylvania barn wood. two farm tables with matching benches, made from the salvaged oak, one in the original cabin, the old, and one in the new addition. It’s the ultimate transformation, because we’ve not only held true to our values –"The New Must Honor the Old and The Old Must Be Present In Every Room of the New"– we've gone a step further, to where the old actually BECOMES the new. From tree to beams to table, wood harvested, reclaimed and transformed so that we can gather and break bread in the same place, in the same way, that generations of families have before us. That awareness of connection and belonging and transformation, of weaving the past into the present to create the future, still inspires us. And we think it can inspire anyone who faces that apparently stark choice between old and new in their lives and families, in our jobs and companies. And that's why, on certain days, when a storm has cleared and the light is just right, this historic home becomes, as a symbol of creativity and connection, the cabin at the end of the rainbow. I think that's important enough to pass on. One Minute! One Idea! Ep. 14 "Apply Your Principles"
Today’s idea is “Apply Your Principles”. In Season 2, we’re focused on a case study built around the decision that my wife Rebecca and I made to return to our roots in rural America. We bought a farm, decided to restore the cabin that came with it and settled on our guiding principles – the values – that would guide it. “The new must honor the old, and the old must be present in every room of the new”. Now to apply those lofty principles. We tore down the addition and replaced it with new construction that matched the original structure. For the floors – tile, vinyl, carpet? Nope…reclaimed oak fence boards from the area. Kitchen cabinets from Home Depot? Again, nope…cabinets built from reclaimed Pennsylvania barn wood. Here’s the coolest example. When we tore down the old addition, most of the wood was trash, but Rebecca noticed a small amount of lumber that turned out to be solid 100-year-old oak. Out of the trash it came…she pulled the nails out, we drove it to Amish country, and voila…two farm tables with matching benches, made from the lumber from the tear-down, and now present in both the old and new portions of the cabin. So, “The new must honor the old, and the old must be present in every room of the new”. It worked for us, and the cabin, over and over again. Give it a try. One Minute! One Idea! Ep. 13 "Establish Your Guiding Principles"
Welcome to "One Minute! One Idea!" – where we Deconstruct what’s happening at the intersection of INNOVATION, HUMAN POTENTIAL & the things we do to unlock it, known as LEADERSHIP. Today’s idea is to “Establish Your Guiding Principles”. In Season 2, we’re working with a case study built around the decision that my wife, Rebecca, and I made to return to our roots in rural America. In episode 11, we bought our farm, in episode 12 we realized that the survival of our ancient log cabin would require a complete restoration, starting with the foundation, and that brought us to our next big dilemma. We had hundreds of choices to make along the way…how could we stay true to the authentic essence of the cabin – hand-hewn, 300 year old logs – within the limits of modern materials and methods? We could “modernize” everything and unwittingly end up with a level of luxury that was at odds with the building’s heritage, or go the lowest cost Home Depot route and end up losing its special character. We realized that what we needed were guiding principles – values – that would guide us in the restoration, and we came up with two. “The new must honor the old, and the old must be present in every room of the new”. In episode 14 we’ll see how that played out, over and over again, as we faced challenges to our vision along the way. If you would like to learn more about Deconstruction and how it can exponentially impact your organization, contact me at Dennis@DLBrouwer.com or check out www.DLBrouwer.com. One Minute! One Idea! Ep. 12 "Select Your Starting Point"
Today’s idea is “Carefully Select the Starting Point” for your innovation. If you’ve been following Season 2, you know that we’re working with a unique case study built around the decision that my wife, Rebecca, and I made to return to our roots in rural America. We purchased ten acres and a tiny cabin, which was built in 1785 and it soon became obvious that it was going to need some serious repairs, but we didn’t know where to start. The roof was failing – should we replace it? The “new” 90-year-old addition wasn’t aging well – should we repair it or tear it down? We eventually realized that many of the cabin’s problems started in its ancient, dirt-floor cellar. None of the work we would eventually do would mean anything unless we literally repaired the foundation…the rocks and stones upon which everything else was built. So, today’s idea is to Carefully Select the Starting Point for your innovation. For our cabin, that was literally the foundation…and maybe that’s a good place for the rest of us to start as well. So, we’ve chosen a starting point…now what? Tune in for the next episode. Elon Musk has made a career of pushing things to the limit. His basic brand has always been about exploring outdated assumptions about technology, systems, and what’s possible. Who else has proposed and/or built a svelte product line of electric vehicles, the world’s largest battery factory, and a commercially available personal flame-thrower? It’s been fascinating to watch this develop, and to wonder how long it can last. Over the past two weeks, we may have found out. The list of “things Elon Musk has pushed to (or beyond) the limit" has grown to be truly larger than life. He’s being investigated by the SEC, he’s in trouble with his Board, Tesla’s stock is 20% off its 52 week high, and over $100/share below the price at which he tweeted he had a deal to take the company private. What’s going on? A clue may lie in a defense we’re hearing more of all the time - Ambien. I’m not saying Ambien explains the behavior - although Ambien-tweeting is apparently a thing, and the sleep-aid has been implicated in all sorts of otherwise inexplicable behavior. Another way to say this is that his chosen leadership style is unsustainable. That’s an interesting choice of words, given Tesla’s focus on pivoting away from internal combustion engines to sustainable energy sources, but it fits. Research from The Leadership Circle, a boutique firm that specializes in studying and assessing leadership traits lists “Sustainable Productivity” right beside “Strategic Focus” and “Purposeful and Visionary” when it comes to critical leadership skills. The message is clear…when it comes to leadership, if the leader is running on empty, making questionable decisions, and drawing attention to their exhausted behavior instead of the work at hand, they’ve overlooked a key part of the job. Is this a new thing? Hardly. Two years ago, I met George Blankenship, the former head of sales for Tesla. He’s an amazing guy with experience working for demanding personalities like Steve Jobs and Bill Gates. He spoke openly about his Tesla experience, the pressures, and the ultimate success of meeting the production goals that were in place at that time. That’s great, right? The problem is that this talented executive still choked up when he spoke about the experience, and had left the company shortly after surviving his trial by fire. It simply wasn’t sustainable. Over the past couple of years, Elon Musk has been compared to some pretty amazing people…his car company is named after Nikola Tesla, a protégé of Thomas Edison considered by most to be a bonafide genius. Musk has also been likened to Howard Hughes, who at one time was a young billionaire, aviation pioneer, and inspired inventor who owned TransWorld Airlines (TWA) and a large part of Las Vegas. The problem is that both of those outrageously talented people ended up as cautionary tales on unsustainable trajectories, their personal lives in ruins. So, it’s important to remember that “the job” isn’t just producing results, breaking down barriers, and reaching new heights. It’s also about designing the job, our workplaces, and the things we produce to make us better people...to recognize, celebrate, and cultivate our shared humanity. The machines haven’t taken over yet. Let’s be human until they do. We have a productivity problem…a big one. According to a study recently published by the Organization for Economic Cooperation and Development, since 2001 there has been a fundamental shift in the way the benefits of innovation are moving through the global economy. In the past, it was routine for the benefits of innovation, in both technology and services, to percolate through entire supply chains, but that’s changed. Per the OECD study, the benefits of innovation, globalization and automation are increasingly flowing to technology giants. These multi-national players, the top 5% of all companies, drive growth through their ability to exploit global markets, leverage multi-billion dollar R&D budgets, and implement sweeping strategies for automation. We’ve all experienced first-hand the upside of these mega-cap companies as we access e-commerce, communicate (perhaps too) freely, and leverage the power of new communities. That’s great for the “Haves” (think Amazon and Apple), but it carries a shocking challenge for the other 95%, the “Have Nots”. For that other 95%, who lack global scale and can’t fund large, long-term investments, things are getting scary. It’s one thing to co-exist in a stable industry in a flat market, with the same old competitors you’ve always had. It’s another thing to have a digitally-enabled competitor riding a completely different innovation and productivity curve concern show up in your market and up-end the relationships you’ve carefully built with your customers and suppliers. For the vast majority of companies who are newly christened “Have-Nots”, it’s critical to focus on specific, targeted markets where their relative strength can be brought to bear. Research shows that companies that are successful in this segment are a blend of high-performing teams and insightful, challenging leadership. In many cases, these companies have used their dynamic cultures to make innovation a routine part of the way that leaders behave, teams work, and the business runs. For many organizations this is a radical change to the way they do business, and in most cases they’re not sure where to begin. Team dynamics and leadership behaviors are seen as unquantifiable soft-skills, and organizations are often locked into legacy functional structures that impede collaboration. At some point, though, almost every company needs to take a deep breath and consider a radical new approach to their business opportunity. With that in mind, here are three easy steps to help the other 95% assess their level of risk when it comes to innovation and digitally-enabled competitors. BARRIERS TO ENTRY – Is your industry, and specifically your company, protected by high barriers to entry? Things like huge capital investments, if carefully deployed, can protect you from the ravages of newly empowered competitors. Be brutally honest on this one…remember Yellow Cab? They had a virtual monopoly on the taxi business in NYC, until Uber and Lyft came along, and now they are relying on legislation that would cap ride-hailing firms in the city. In reality, most barriers to entry are of questionable value. UPDATED VISION – Have you challenged your corporate Vision within the past two years? If you haven’t gone off-site and challenged your core assumptions about your value to your customers and suppliers, you are probably a sitting duck. If you can’t point to a new app, a new IT or capital investment that people are actually enthusiastic about, there’s a good chance that an upstart is targeting you and your legacy market right now. If the conversations at your off-site don’t get at least a bit ugly, you haven’t pushed hard enough. MARGIN PRESSURE – When is the last time you scrubbed your cost structure to improve profitability and free up cash for investment? If you aren’t doing this at least twice a year, you are spending too much to provide the services you cherish. The greatest risk around a services business is falling prey to the conventional wisdom that “our customers won’t settle for less”. Instead of asking “what can we stop doing”, try asking “how can we change or service model to create more value, while reducing our costs”. Sound tough? Maybe later? WHY BOTHER? Your competition is doing it right now. One Minute! One Idea! Ep. 11 "Agree on a Vision"
If you’re heading out to a new destination and you’re like most people, you whip out your trusty smart-phone and fire up the map app. What’s the first thing it asks? WHERE DO YOU WANT TO GO! We accept this as a normal and necessary precursor to our trip, but all too often we’re willing to skip the step of defining our destination in our daily lives. Goals for our careers, companies, and personal relationships? We tend to avoid them because of our mistaken beliefs that goal-setting requires a crystal-ball or that the future will be a repeat of the past. In episode 10, I introduced our case study for this season – the decision my wife Rebecca and I made to follow our hearts and return to our roots in rural America. 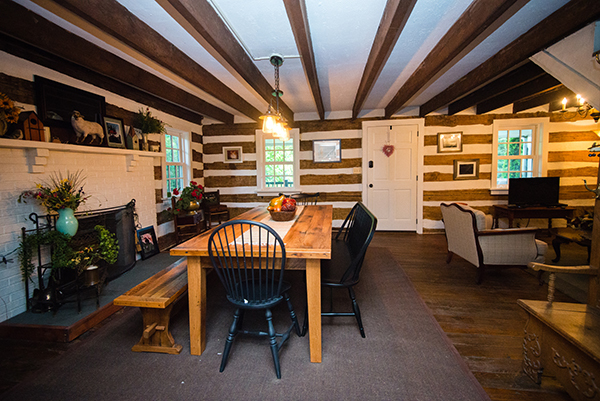 We went looking for land in western Loudoun County Virginia, but what we found was a farm, complete with a log cabin – not some manufactured log house, but a real, hand-hewn log cabin, circa 1785. We looked at the cabin, looked at each other, and said: “This is it”. Our shared vision? To invest in our future by returning to our roots.